Subject description: A new design with the CEM3340! 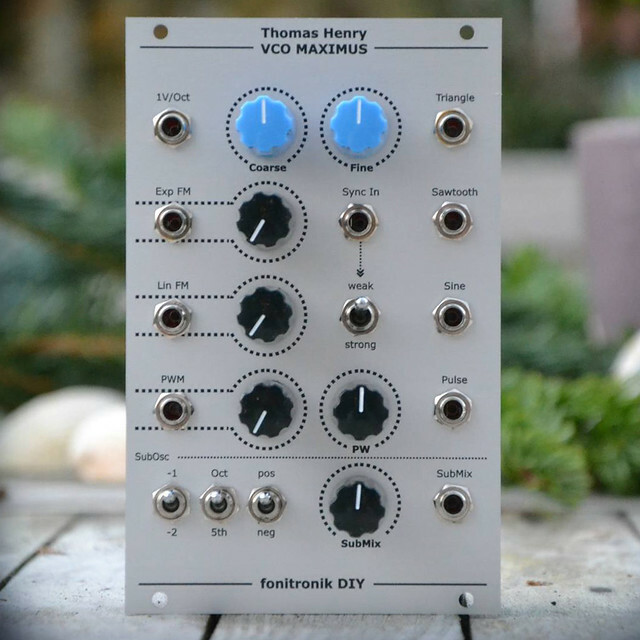 I'm delighted to announce a project that might just tickle your fancy: The VCO Maximus. It's a new design featuring the recently rereleased CEM3340 from OnChip. Besides requiring no matched pair or thermistor, yet accurately covering a huge range, the Maximus comes packed with all sorts of cool features. I couldn't have handled all this without the inestimable help of the VCO Maximus Team: Tim Heffield, Scott Stites and Matthias Hermmann. They literally broke their bottoms (as Basil Fawlty put it) testing, correcting, suggesting and more. I'm not sure how many man-hours went into this, but the past two months were quite intense for all of us on the team, with many late night hours. I thank them all for their enthusiasm, skill and persistence! Be sure to click around on all the buttons there to see what's what. There's nothing to raise me from my Synth-DIY slumber than the double whammy of the CEM3340 being released *and* a Thomas Henry design to support it! You both did a great job here again. Sending a big thank you to the both of you. And thank you very much. Let me hasten to mention that there were four of us involved on this project: Tim Heffield, Scott Stites, Matthias Herrmann joined me for the hair-pulling revelry. Last night spent about four hours putting together a music demo of the VCO Maximus. I used a midi file from the web composed by Morton H. Svendsen in 1997 called "Planet Arcturus". The MP3 file is comprised of eleven tracks of multi-recording with two of the tracks being drums. All of the voices are from the VCO Maximus prototype shown on the Birth of a Synth website, except the drums. I also used a 2040 VCF clone and other synth modules but no other VCOs. The Maximus was tuned an octave lower for the first bass track, and then retuned to A 440 using a guitar tuner for all of the other tracks. It was not re-tuned for the whole four hours of recording. Very nice sounding VCO, but I hate to the highest degree that drum thump thump thump - just me, but then I'm a guitarist!!! Yeah, I listened to it several times this morning in the car on the way to work and I have to agree with you...it's very monotonous! I guess it's typical 90's for a trance kind of sound. It was part of the MIDI file so I left it that way with bad judgment. Charges for the product are $15.00 US each up to 499 pieces. $35 shipping to non USA countries.. ...Fingers crossed Thonk get them in! Has a lovely sound to it - and so many features like sine, pulse/sub and fifth/octave interval too. Great stuff!! I really hope someone does a +/-12V layout for it!! I am still working on the PCB layout for this one. I will provide value changes for 12V operation as well. Great news I will certainly be interested in at least one pcb and panel. I already have a couple of your TH designs - the 555 and 4046 - from Synthcube. This would complement them very well. Btw do you by any chance have a single sided design for the sn super controller that I could etch? for the supercontroller i never had a single sided layout, sorry. Ok, thanks for letting me know. Look forward to the Maximus pcb. prototype PCB had a few errors on it, but now it is working flawless. i even already calculated the values for 12V operation. it should be available before christmas. Thanks for the good news Matthias ! Is there BOM available somewhere? This must be the only 3340 design which actually uses the soft/hard sync inputs on the chip for anything, in addition to Jürgen Haible's one (http://jhaible.com/legacy/tonline_stuff/hj2vco.gif). So this will be available also as panel/pcb kit? the original BOM is available via the link to scots stites thomas henry pages in the 1st post of this thread. we will offer PCBs and eurorack panels, and for 12V a few values have to be changed. furthermore the PCB offers a pulse out parallel to the submix output. i will publish a BOM soon. PCBs and Panels should be available before christmas. Just ordered the PCB/Panel and a CEM3340 from Thonk. Can't wait! I am building this now. Is there a write up or schematic that presents the voltage regulator found on this PCB? Should I be ordering a variable or fixed voltage type? I'm also wondering about C1_B, R26_B and R27_B on the PCB. These are not described in any BOM I found. Thank you. Not sure anyone here is aware of this, but there is a discussion currently happening on MuffWiggler concerning some pitch variance issues related to changing the pulse width. Several have reported that changing the pulse width changes the frequency of all waveforms, in one account by as much as 4-5Hz at 1kHz. The sub-oscillator and sub mix apparently have some influence, as does grounding between the boards. It was suggested that someone mention the issue here, so, here it is. Has anyone here experienced similar responses from the eurorack build? I'm currently in a holding pattern with my build with only the resistors, diodes and sockets installed, I'm hoping that between the two forums an answer to the issue is found.